This month up for giveaway is a Limited Edition 125 Anniversary 5-Piece Channellock tool roll set that has been engraved with "1886-2011-- 125 Years Strong." This set is so limited, that when Channellock sent me the tool roll to try out, my own set did not have the special engraving. 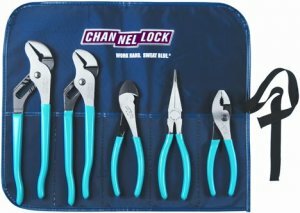 This 5-piece set of tools is perfect for your average homeower/DIYer or even a professional tradesman. The roll has tools that can help you conquer almost any task. The two tongue & groove pliers are great for plumbing, the cutting plier is your go-to for your cutting needs, the long nose pliers are for those hard to reach places, and the slip joint plier is great for smaller gripping and twisting tasks. For those of you that want everything in its place, the set can be wrapped up snug in its own tool roll. This set would make a great Father's day gift, though please note that this giveaway will not end until after Father's Day. Entries can be submitted until Thursday June 30 2011, at 11:59PM ET. Good luck!